Public relations, like all industries, is being disrupted by technology, and Pressboard wants to lead that change. For CTO and co-founder Tiam Korki, that means an intense focus on customer experience and the impact that Pressboard’s product has on the life and career of its customers. When it comes to building products, Korki’s priorities as CTO are clear: build based on customer feedback, needs, and demand. “One of the challenges you have to overcome if you want to build a successful company… is to [focus on] the significance of the technology you’re providing in their life and career,” he said. Most founders will talk about how important customers are and how startup employees need to ‘be the voice of the customer,’ but only building based on customer feedback is a different story. Often a business will have competing priorities or politics that could throw product development off course. In most organizations, the CTO is someone who wouldn’t be focused on these problems, instead thinking about building the product based on directions from other departments and the CEO. For Korki, the process is flipped. “I see my role as someone who brings technical thinking to the company,” he added, noting that the CTO role isn’t just about product development, but acting as a business executive that thinks about customers, culture, and more. “The role of CTO, as well as running the engineering team and making sure tech gets out there… it’s also about company culture,” he explained. The technical thinking that Korki brings to Pressboard as CTO also revolves around ensuring that retention and customer experience are part of the building process. “It’s not just about finding your next customer,” he said. “It’s also about providing the best experience to that customer.” He added that a new customer, while great, is not enough for a company to thrive. A good customer experience leads to happy, repeat, and growing customers, which leads to more revenue and growth over time. For Korki, customer-centric development also means getting crystal clear on not just the skills you need from your team but the ways you want people to act (culture) and the vision you’re asking people to buy into. The challenge of finding talent that aligns on all skills, culture, and vision, said Korki, is the biggest one he faces in his role. Korki combats mounting recruiting pressure by educating himself and his team on technology coming down the pipeline, with a focus on skill development. This diligent focus on learning reinforces the product vision over and over for his team to help build the next phase or feature. A focus on learning also helps the team maintain what Korki calls a ‘healthy paranoia’ about customer needs and future obstacles. Throughout the product development process, the Pressboard team is encouraged to experiment and predict any possible obstacle that a customer may face (for example, what to do during an outage). Then a process can be built to mitigate issues or avoid them entirely. 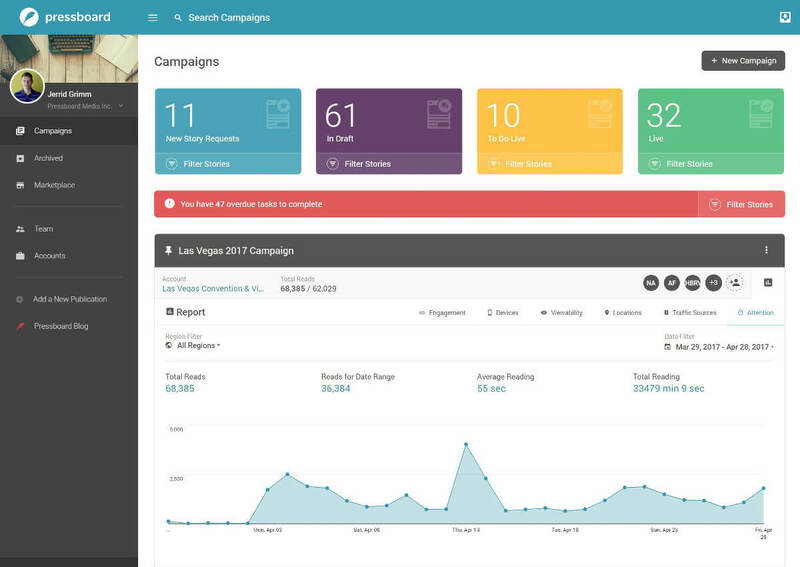 A screenshot of the Pressboard platform. Ensuring these kinds of processes are successful isn’t simply a matter of implementing them, however. Korki admits that while he loves to code, he spends most of his time as a leader doing administrative and managerial tasks that are necessary to keep the business running. These tasks range from being the “technical mind” in executive meetings, to recruiting, to focusing on culture – all of which support execution-focused development processes because the team feels supported and connected. The other major task that Korki spends his time on is the product roadmap for Pressboard. When asked how companies can disrupt themselves, Korki stated that experimentation and R&D are the two best ways. Whether you have resources to hire someone specifically for R&D, or you embed an experimentation mentality into your team, he says this is necessary for companies and teams that want to grow.